A core overarching aim of Relational Frame Theory (RFT) research on language and cognition is the prediction and influence of human behavior with precision, scope, and depth. However, the conceptualization and delineation of empirical investigations of higher-order language and cognition from a relational framing theoretical standpoint is a challenging task that requires a high degree of abstract reasoning and creativity. To that end, we propose using symbolic notation as seen in early RFT experimental literature as a possible functional-analytical tool to aid in the articulation of hypotheses and design of such experiments. In this article, we provide examples of aspects of cognition previously identified in RFT literature and how they can be articulated rather more concisely using technical notation than in-text illustration. We then provide a brief demonstration of the utility of notation by offering examples of several novel experiments and hypotheses in notation format. In two tables, we provide a “key” for understanding the technical notation written herein, which other basic-science researchers may decide to draw on in future. To conclude, this article is intended to be a useful resource to those who wish to carry out basic RFT research on complex language and cognition with greater technical clarity, precision, and broad scope. The study was not supported by any grant funding from any institution or organization. On behalf of all the authors the corresponding author confirms that no author has a conflict of interest to declare. Not applicable as not an empirical study paper. Barnes-Holmes, Y., Kavanagh, D., Barnes-Holmes, D., Finn, M., Harte, C., Leech, A., & McEnteggart. (2018). Review: Mastering the clinical conversation: Language as intervention by M. Villatte, J. L. Villatte, & S. C. Hayes. 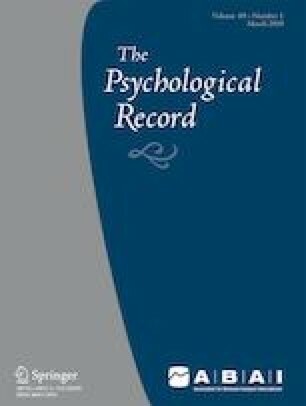 The psychological record. doi: https://doi.org/10.1007/s40732-017-0229. McLoughlin, S., Tyndall, I., & Pereira, A. (2018). Piloting a brief relational operant training program: Analyses of response latencies and intelligence test performance. European Journal of Behavior Analysis, 1–19. https://doi.org/10.1080/15021149.2018.1507087.